Sometimes an individual needs a little extra support getting started, and often we need a little more support to deepen our practice. If you are a beginner, it can be intimidating to join an ongoing class, and we'd like to lower barriers to explore yoga. If you have a consistent practice, you may want to begin building into more advanced poses, with the assistance of an instructor. Whatever your reason, individual sessions are designed around YOU. We start where you are, and take you where you want to be, as your body allows. 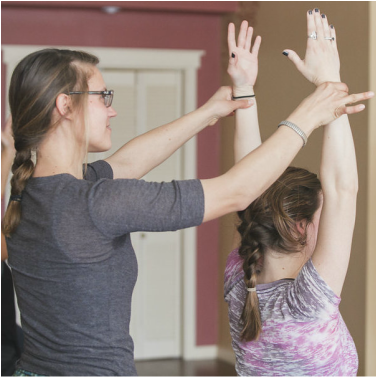 Whether preparing to enter one of our scheduled classes, begin a home practice, enhance an existing practice, or work on a specific ailment or healing process, one-on-one sessions might be a solution for you. Sometimes we want to share and explore yoga with others that we know and love. Group sessions can be designed with a certain focus in mind, or be purely fun. Base rate is $50/hour session held at Plymouth Yoga. Session length is adjustable, studio space available for pre/post yoga celebration. Please contact us for further information about hosting classes on site at your location.